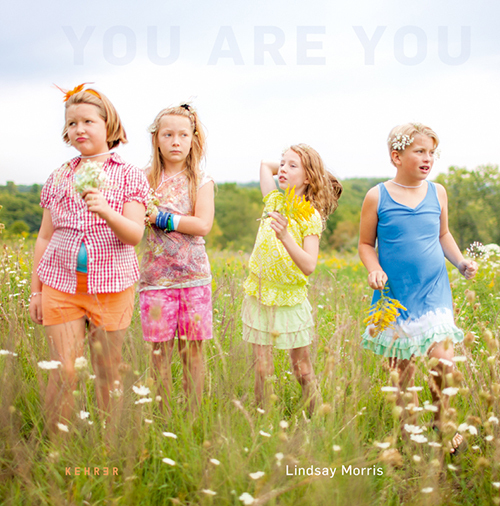 You Are You marks a kind of watershed, describing a group of gender-nonconforming children who enjoy a supportive community, perhaps the first generation to do so in this way. Broader social acceptance of transgender identities and experiences have changed substantially over the eight years since Lindsay Morris began the project in 2007. What was once called “gender identity disorder” has been redefined as gender dysphoria in the DSM-5: gender nonconformity is no longer considered a disorder that should be treated, but a condition that should be acknowledged. Transgender celebrities and an increasingly visible mobilization for the rights of transgender people have afforded increasing social normalization and acceptance of transgender identities. “Camp You Are You” is Morris’ pseudonym for an annual retreat where gender-fluid children express themselves freely and safely, with support, rather than judgment. The retreat provides a haven for children aged 5-12 who do not conform to traditional gender conventions, away from the everyday categories and expectations that call these children’s personal identifications and impulses into question - and which their impulses call into question. While adults are absent from most of the pictures, the camp is a support network for families as well. Morris herself began attending the camp in 2007 to support a loved one. Morris’ photography in You Are You is graceful. Children dress in pastels, in fields of wildflowers with flowers in their hair, running and laughing in little groups; Morris depicts them with a softness reminiscent of Clarence White’s Pictorialist idylls of childhood. We see children playing around camp buildings, hanging out in bunk rooms, posing for Morris’ camera. Morris’ observational images signal metaphors: a child is dressed in a pink gown with butterfly wings bending under heavenly, cathedral-like light; another, wearing a peach dress and orange shoes, is wedged between two columns. Empty stages suggest potential stories, lives that have not yet been written. It’s when the children pose that the complexity of emotion is evoked. Morris wants us to see that these are self-aware individuals; this is evident before you notice or might be compelled to ask if the subject is a boy dressed as a girl. This self-awareness is always present in some degree, whether expressed as confidence or uncertainty. A child stands in a green dress and heels, hair falling over shoulders, hands on hips, looking into the camera. Is this a challenge, or an emulation of an idea of what a woman should be? Or something else? Morris’ photographs may act as a mirror to the children, in which she confirms them in the way that they think of themselves, but, more significantly, the project is groundbreaking in the way that it encourages conversations about childhood and gender. The project, with its positive and supportive narrative about gender-fluid children was published in The New York Times Magazine in 2012, and has since been published internationally in print and online. The book, funded by a Kickstarter campaign, extends the reach of the project, serving as both reference (the book contains a list of resources ranging from support organizations to children’s books that encourage the acceptance of differences, some without even engaging gender specifically) and inspiration for re-evaluating how we think about gender. Yet even for those with the best intentions, the spaces between the ideals of fixed, binary genders can be difficult to maneuver. “Even physicians who treat transgender youth often impose their own either-or perspective, dismissing gender-fluid adolescents –those young people who are willing to live without a defined M or F identity – as ‘not transgender enough’, “ notes Dr. Norman Spack in the book’s foreword. With children, the questions surrounding gender are all the more difficult to negotiate; should a six year old have a fixed idea of what their identity will be as an adult? How could we expect a child to engage with the ever-changing, culturally and politically loaded nomenclature by which we assign positions to individuals? It would be wrong to assume that all of the children in the book express themselves in these ways for the same reasons, or that their future expressions and identifications will not diverge. Now is now: when are we more present than when we are children? The complexity of navigating these spaces between established male and female categories is evidenced in Morris’ photographs of the fashion show that is a highlight of the retreat. Children prepare their outfits – dresses, scarves, prom gowns, and less conventional ensembles – and parade before their friends and family with music and glitter. While at first glance the fashion show appears to confirm established constructions of female glamour, Morris, by presenting the buildup and the denouement, reveals that the event is, for the children, about self-expression and being seen as beautiful and unique. In some two dozen images, Morris shows us the many different individual creative responses, a range of ways in which the children chose to express themselves: as performance, as projection, as play, as themselves. Support Fraction and purchase You Are You here.